Prof. Jeffrey T. Runner is the Dean of the College in Arts, Sciences & Engineering. Prof. Runner has been a member of the Center for Language Sciences since 1994, six years as its Director. 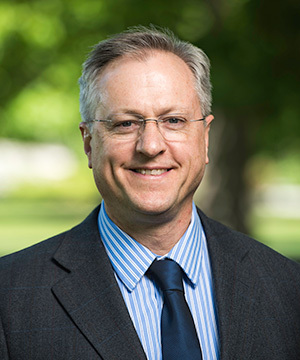 He has been a Faculty Associate of the Susan B. Anthony Institute for Gender and Womenís Studies since 2003, serving as its Curriculum Director, Chair of the Curriculum Committee, Chair of the Governance Committee and for one year as Acting Director. He served as Faculty Development and Diversity Officer for Arts, Sciences and Engineering. He has been the editor of Syntax and Semantics book series since 2010. A 2006 recipient of the Goergen Award for Distinguished Achievement and Artistry in Undergraduate Education, Jeff Runner has been teaching at the University of Rochester since 1994, in Linguistics, Brain & Cognitive Sciences. He has taught at the Linguistic Society of America Summer Linguistics Institute at Stanford and at the Summer School in Experimental Grammar at Isle de Berder, France. Jeff Runner's research uses visual world eye-tracking and other experimental methodologies to examine the fine-grained time course of language comprehension, focusing on the complex interactions between linguistic structure (specific properties of words, phrases and structures) and visual and discourse information. He and his students monitor participants' eye movements to real objects or to scenes displayed on a computer screen while they listen to sentences describing the scenes. Specifically, they are interested in how linguistic and visual context affects the interpretation of anaphoric expressions (e.g. pronouns and elided verb phrases), which are particularly challenging because they provide only impoverished linguistic information, depending on previous context to be understood. His research has been supported by National Science Foundation since 2002 and he has published in some of the top journals in the field, including Linguistic Inquiry, Cognition, Syntax and Cognitive Science, and in The Blackwell Companion to Syntax. He has presented his work and/or published in the proceedings of a number of Linguistics and Psycholinguistics conferences, such as the North Eastern Linguistic Society, Chicago Linguistic Society, International Conference on HPSG, West Coast Conference on Formal Linguistics, CUNY Human Sentence Processing Conference, Architectures and Mechanisms of Language Processing, International Conference on Linguistic Evidence, and the Linguistic Society of America. He has been an invited scholar at Brown University, Universite Paris-Diderot, UT Austin, and Stanford University. Runner, Jeffrey T. and Keir Moulton. (To appear). The Accusative Plus Infinitive Construction in English. In M. Everaert and H. van Riemsdijk, eds., The Blackwell Companion to Syntax, 2nd Edition. Oxford, UK: Blackwell Publishers. Kim, Christina, Christine Gunlogson, Michael Tanenhaus and Jeffrey T. Runner. (2015). Context-driven expectations about focus alternatives. Cognition 139: 28-49. Runner, Jeffrey T. and Kellan D.L. Head. (2014). What Can Visual World Eye-tracking Tell Us About the Binding Theory? In Christopher Piñón (ed. ), Empirical Issues in Syntax and Semantics 10, Paris. CSSP–Colloque de Syntaxe et Sémantique à Paris: 269-286. Kim, Christina, Greg Kobele, Jeffrey T. Runner and John Hale. (2011). The Acceptability Cline in VP Ellipsis. Syntax 14.4: 318-354. Runner, Jeffrey T. (2011). Ed. Experiments at the Interfaces. Syntax and Semantics. Vol. 37. Emerald Publications, Bingley, England. Runner, Jeffrey T. and Micah B. Goldwater. (2011). On the Representational Nature of Representational Noun Phrases. In Jeffrey T. Runner (ed.) Experiments at the Interfaces. Syntax and Semantics. Vol. 37. Emerald Publications, Bingley, England. Kaiser, Elsi, Jeffrey T. Runner, Rachel S. Sussman and Michael K. Tanenhaus. (2010). Picturing the syntax / semantics interface during on-line Processing. In Raffaella Folli & Christiane Ulbrich (Eds. ), Interfaces in Linguistics: New Research Perspectives, Oxford Studies in Theoretical Linguistics 31, Oxford University Press. Kaiser, Elsi, Jeffrey T. Runner, Rachel S. Sussman and Michael K. Tanenhaus. (2009). Structural and semantic constraints on the resolution of pronouns and reflexives. Cognition 112: 55-80. Kim, Christina and Jeffrey T. Runner. (2009). Discourse structure and parallelism in VP ellipsis. Proceedings of the 19th Semantics and Linguistic Theory Conference, The Ohio State University, ed. Ed Cormany, Satoshi Ito, and David Lutz, 275-287. Kaiser, Elsi and Jeffrey T. Runner. (2008). Intensifiers in German and Dutch Anaphor Resolution. In Proceedings of the 27th West Coast Conference on Formal Linguistics, ed. Natasha Abner and Jason Bishop, 265-273. Somerville, MA: Cascadilla Proceedings Project. Kaiser, Elsi, Runner, Jeffrey T., Sussman, Rachel S. and Tanenhaus, Michael K. (2008). The real-time interpretation of pronouns and reflexives: Structural and semantic information. In Emily Elfner & Martin Walkow (Eds.) NELS 37: Proceedings of the 37th Annual Meeting of the North Eastern Linguistic Society. Runner, Jeffrey T. (2007). Freeing Picture NPs from Binding Theory. In Jill Thorson & Lynsey Wolter, eds., University of Rochester Working Papers in the Language Sciences, 3.1, 57-90. Kaiser, Elsi, Runner, Jeffrey T., Sussman, Rachel S. & Tanenhaus, Michael K. (2006). The interpretation of pronouns and reflexives in picture noun phrases: effects of non-structural factors. In Michal Temkin Martínez, Asier Alcázar and Roberto Mayoral Hernández (Eds.) Proceedings of the thirty-third Western Conference On Linguistics Vol. 16. Fresno, CA: California State University at Fresno. Runner, Jeffrey T. (2006). Lingering Challenges to the Raising to Object and Object Control Constructions. Syntax 9.2: 193-213. Runner, Jeffrey T. (2006). The Accusative Plus Infinitive Construction in English. In M. Everaert and H. van Riemsdijk, eds., The Blackwell Companion to Syntax. Oxford, UK: Blackwell Publishers. Runner, Jeffrey T., Rachel S. Sussman and Michael K. Tanenhaus. (2006). Processing Reflexives and Pronouns in Picture Noun Phrases. Cognitive Science 30, 193-241. Runner, Jeffrey T., Sussman, R.S. and Tanenhaus, M. K. (2006). Reflexives and pronouns in picture noun phrases: using eye movements as a source of linguistic evidence. In S. Kepser & M. Reis (Eds.) Linguistic Evidence. Mouton de Gruyter. Kaiser, Elsi, Jeffrey T. Runner, Rachel S. Sussman & Michael K. Tanenhaus. (2005). What influences the referential properties of reflexives and pronouns in Finnish? In Christian Ebert & Cornelia Endriss (Eds.) Proceedings of Sinn und Bedeutung 10. 155-169, ZAS Working Papers in Linguistics No. 44 Vol. 1, Berlin. Runner, Jeffrey T. and Elsi Kaiser. (2005). Binding in Picture Noun Phrases: Implications for Binding Theory. In Stefan Müller, editor, The Proceedings of the 12th International Conference on Head-Driven Phrase Structure Grammar, Department of Informatics, University of Lisbon. 594–613. Stanford: CSLI Publications. URL: http://cslipublications.stanford.edu/HPSG/6/. Runner, Jeffrey T. (2004). Insights into Binding and Ellipsis from Head-mounted Eye-tracking Experiments. In Jonathon E. Cihlar, David W. Kaiser, Irene Kimbara, and Amy Franklin (eds. ), CLS 39 The Panels: Proceedings from the Panels of the Thirty-Ninth Meeting of the Chicago Linguistic Society. Runner, Jeffrey T. and Raul Aranovich. (2003). Noun Incorporation and Constraint Interaction in the Lexicon. In S. Mueller (ed. ), The Proceedings of the 10th International Conference on Head-driven Phrase Structure Grammar, Stanford: CLSI Publications. Runner, Jeffrey T., Rachel S. Sussman and Michael K. Tanenhaus. (2003). Assignment of Reference to Reflexives and Pronouns in Picture Noun Phrases: Evidence from Eye Movements. Cognition 89, B1-B13. Runner, Jeffrey T. (2002). When Minimalism isn’t Enough: an Argument for Argument Structure. Linguistic Inquiry 33.1. Runner, Jeffrey T., Rachel S. Sussman and Michael K. Tanenhaus. (2002). Logophors in Possessed Picture Noun Phrases. In L. Mikkelsen and C. Potts, eds., WCCFL 21 Proceedings, pp. 401-414. Somerville, MA: Cascadilla Press. Aranovich, Raul and Jeffrey T. Runner. (2001) Diathesis Alternations and Rule Ordering in the Lexicon. In K. Megerdoomian & L.A. Bar-el, eds., WCCFL 20 Proceedings, Somerville, MA: Cascadilla Press. Potsdam, Eric and Jeffrey T. Runner. (2001). Richard returns: Copy Raising and its Implications. In M. Adronis, C. Ball, H. Elston and S. Neuvel, eds., Proceedings of CLS 37, pp. 453-468. Runner, Jeffrey T. (2001). The Double Object Construction at the Interfaces. In Katherine Crosswhite & James Magnuson, eds., University of Rochester Working Papers in the Language Sciences 1.3. Runner, Jeffrey T. (2000). The External Object Hypothesis and the Case of Object Expletives. In J. Magnuson & K. Crosswhite (eds. ), University of Rochester Working Papers in the Language Sciences, 1.2. Runner, Jeffrey T. (1998). Noun Phrase Licensing, Garland Publishing, New York. Runner, Jeffrey T. (1998). BT Exempt Anaphors: An Argument from Idiom Interpretation. In E. Curtis et al., eds., Proceedings of Sixteenth West Coast Conference on Formal Linguistics, CSLI, Stanford. Runner, Jeffrey T. (1995). Noun Phrase Licensing and Interpretation, Ph.D. thesis, University of Massachusetts, distributed by GLSA, Amherst. Runner, Jeffrey T. (1995). Overt and LF Object Positions in English. In Leslie Gabriele et al (eds. ), Proceedings of the Sixth Annual Meeting of the Formal Linguistics Society of Mid-America, Indiana University, IULC, Bloomington. Runner, Jeffrey T. (1995). Reconstruction and Mapping. In Regine Eckardt & Veerle van Geenhoven (eds.) ConSole 2 Proceedings: Proceedings of the Second Conference of the Student Organization of Linguistics in Europe, Holland Academic Graphics, The Hague. Benedicto, Elena and Jeffrey T. Runner, eds. (1994). University of Massachusetts Occasional Papers 17: Functional Projections, GLSA, U. Mass., Amherst. Runner, Jeffrey T. (1993). Quantificational Objects and Agr-o. In Vern Lindblad & Michael Gamon (eds. ), MIT Working Papers in Linguistics 20: Papers from SCIL V, MIT Working Papers in Linguistics, Cambridge.